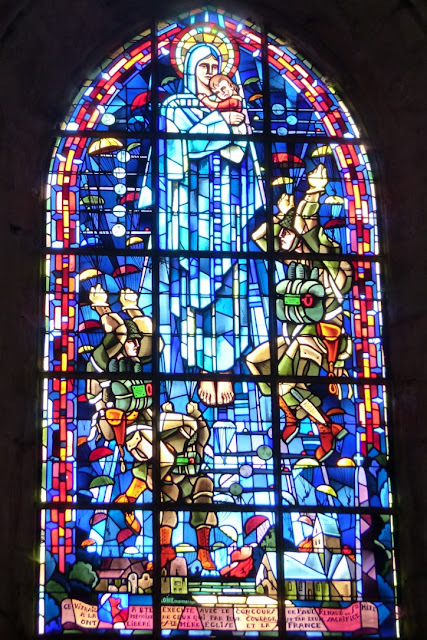 Sainte-Mère-Église: stained glass window in village chapel depicting the landing of the paratroopers. 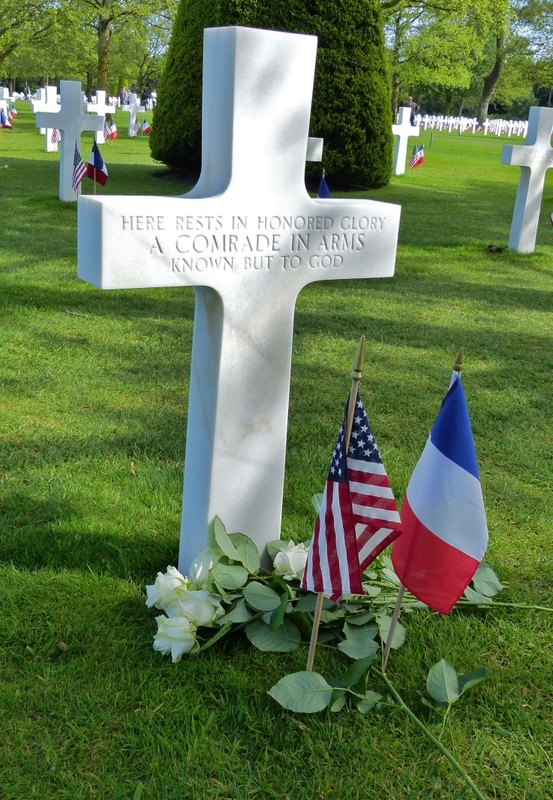 On Memorial Day one year ago, with sunset approaching, my wife Peggy and I quietly walked among the thousands of brilliant white headstones in the Normandy American Cemetery in Colleville-sur-Mer, Normandy, France. Emotions swelled. 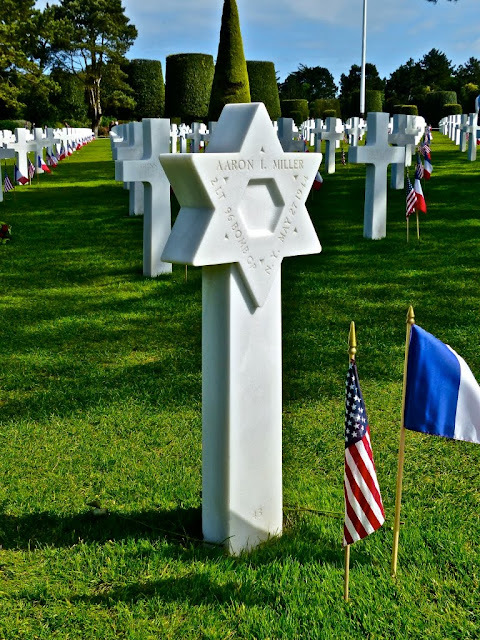 We arrived at the cemetery following a day-long tour of the Normandy coast where American soldiers and sailors, among whom were family elders, stormed Utah and Omaha beaches, and clawed up Pointe-du-Hoc, on D-Day, June 6, 1944, while allies Great Britain and Canada assaulted Gold, Juno, and Sword beaches. Craters carved by naval bombardment on the bluffs above the beach cliffs, along with the ruins of bunkers and cannon emplacements, remain as silent memorials that tell of a history we must never forget. 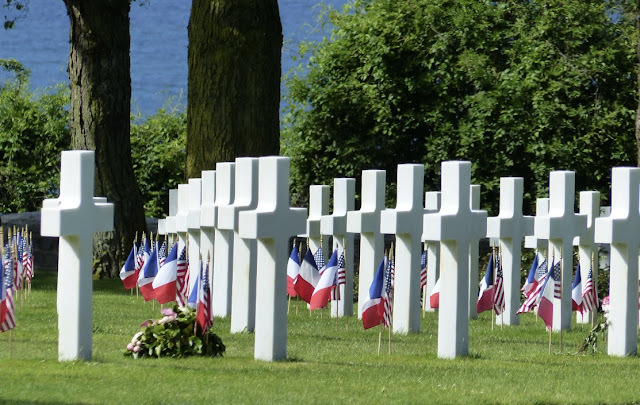 As the lowering sun cast somber shadows across the cemetery, we paused in reverence as a bugle gracefully sounded taps, and the Stars and Stripes slowly descended to rest for the night. Emotions swelled. In solemn gratitude on Memorial Day we remember and honor the men and women who dutifully served our nation throughout its history in hopes of keeping our country and the world safe and free from tyrants and tyranny.